Honda’s new CRF450L is a great trail bike but in standard trim its uses are limited. But Yorkshire-based Adventure Spec have spotted its potential and designed a whole range of products to toughen it up and expand its horizons into a true all-day capable adventure bike. Starting at the front, there’s a brand-new mini-fairing which bolts straight onto the top yoke and is home to mounting points for a GPS (using the standard AMPS mount), 12V socket and heated grip switch. The fairing costs £89. 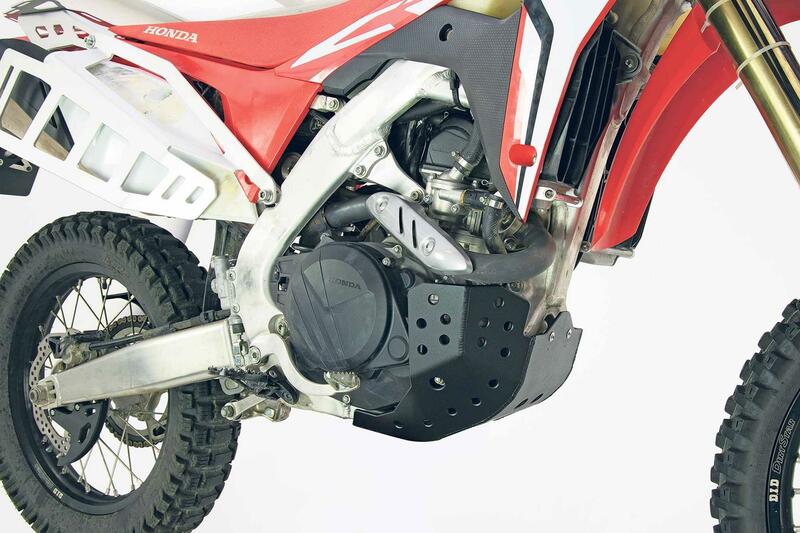 Moving back, Adventure Spec have also designed some much-needed protection, most significantly a 4mm-thick aluminium bash plate, which helps save the engine from the rocks and flying debris that would slip straight through the frame’s double cradle or puncture the bike’s standard plastic offering. Joining the bash plate is a set of alloy radiator guards, should you drop your precious machine these guards won’t foul the tank or make the bike any wider. The bashplate costs a reasonable £99 and the radiator braces cost £79. While at the back end of the bike, Adventure Spec have focused on its potential for multi-day excursions, by designing a small rear luggage rack and a pair of pannier support frames. The rack is aluminium and can be used with or without the pannier frames. These are also made from light but tough alloy, are designed to support soft luggage to prevent it finding its way into the rear wheel, or sitting on top of a hot exhaust. The luggage supports are £139 and the rear rack is £69. There’s also an alloy tail tidy (£69) to reduce rear end bulk while also reducing the odds of losing your number plate down a muddy lane. A 50% larger, 11.4-litre fuel tank is also available (for £300) which boosts range between refuelling stops to a healthy 180 miles, by which time a cup of tea would be much-needed!